With first cut silage out of the way for most people, now might be the time to consider giving your grassland a refresh. To spark a few ideas we have rounded up some of the latest grassland rejuvenation machines. Richard Bradley reports. With the addition of wider, hydraulic folding models, Opico has extended its He-Va Sward Rejuvenator range. Offering working widths of 6.3m and 8.3m, the firm’s Rejuvenator features shatterboards with slicing plates and harrow tines break up and level the soil surface in front of the grass seed outlets, and the soil is then firmed behind by the 600mm diameter Prisma roller. The hydraulically driven seeder features outlets across the machine’s working width, and can handle seeding rates up to 80kg/ha, at forward speeds up to 8kph. Opico says the aggressive slicing plates and harrow action make the machine ideal for use in badly poached fields which require restoration. It can also be used – minus the seeder – for harrowing grassland to remove trash and stimulate grass growth, and for molehill levelling. Taken from its range of rollers, the Rejuvenator features He-Va’s spring active transfer system, which the firm says evenly distributes pressure across each of the machine’s three centre-pivoting sections. Retail price for a 6.3m wide, hydraulic folding machine with air seeder is £38,824 plus VAT. 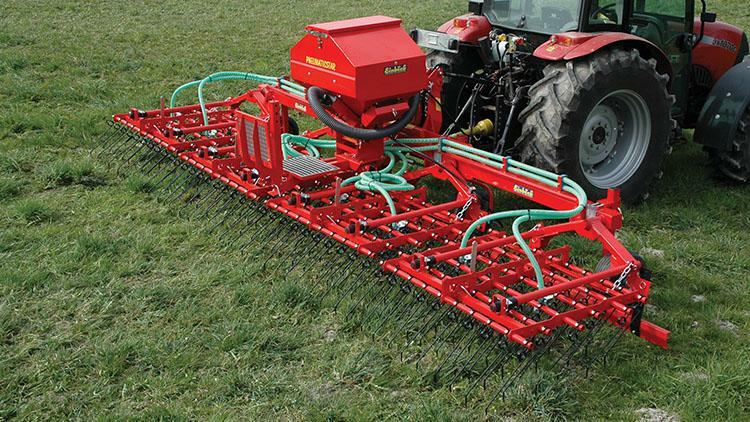 Austrian manufacturer Einbock offers its range of spring-tine grass rakes with an air seeder. Available in two- to 12-metre working widths, the machines features six rows of cranked spring tines to rake out old grass, scratch the soil surface to encourage germination of seed, and stimulate the existing grass for re-growth. The machine’s working width is split into 1.5-2m sections, which are all able to pivot independently of each other to provide effective contour following. Following the tine sections is a number of seeder outlets, which broadcast the seed over the machine’s working width. Models with 2-6m working width feature a hydraulically-driven seeding unit, with larger 9m and 12m wide models using a pto-driven fan. As standard, seed metering comes from a land-wheel, with the option of fitting a GPS or RADAR speed sensor. Options on the firm’s range of Pneumaticstar overseeders includes a larger 500-litre seed tank, front levelling plates to deal with mole-hills and large ruts, and the option of fitting rubber consolidation rollers. 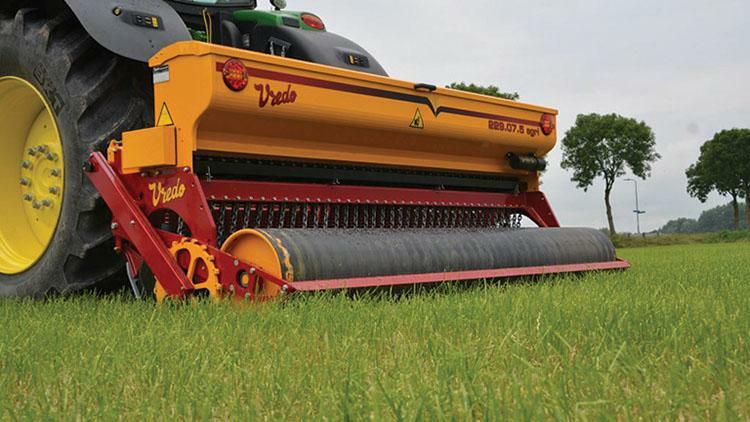 Dutch manufacturer Vredo launched a revamped version of its Agri Series overseeder at this year’s Lamma. Available in 2.5-metre or 2.9m working width, the drill features the firm’s long-standing double-disc design to create a small slot for seed to be dropped into. Spaced at 75mm intervals, discs are spring loaded independently of each other to offer greater contour following, and the firm says working depths down to 20mm are possible. Distribution of seed is mechanical, and is driven via a metering wheel. Inside the drill’s hopper all edges have been rounded to encourage the seed to flow downwards. Consolidation of ground comes from a solid flat-roller as standard, with the option of fitting a packer roller, with floating cast iron rings, again to better follow ground contours. The firm says the drill is suitable to overseed grass throughout the year on grazed or harvested land, and can save up to 80 per cent on time and fuel when compared to plough-based reseeding. 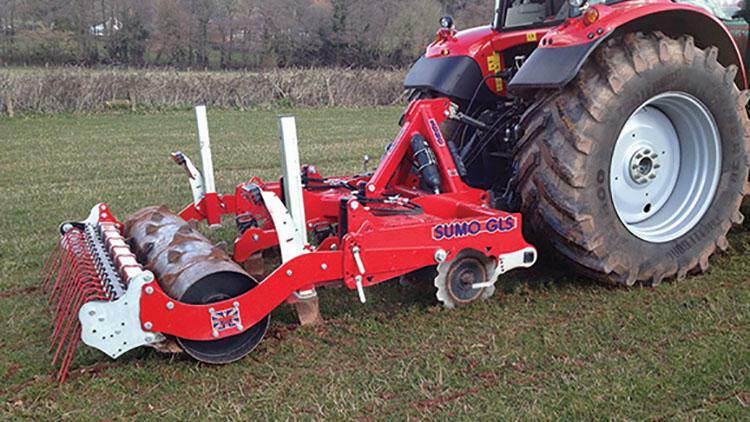 Whereas other machines only aim to tickle the soil’s surface, Sumo’s Grassland Subsoiler (GLS) features cultivating legs to alleviate soil compaction. Available in linkage-mounted three-, four- (2.3m wide) or five-leg (2.8 wide) formats, each model features adjustable working depth from 100-350mm. Upfront, serrated straight discs are mounted on suspended arms to create a clean-cut into the soil. Disc depth can be set by four position holes. Legs, which feature one-piece narrow wing points, are constructed from 20mm Hardox steel and use shearbolt protection as standard – hydraulic auto-reset is available as an option. Bringing up the rear is a shark-fin roller packer, which the firm says provides an aerated finish, as well as consolidating the open slits. 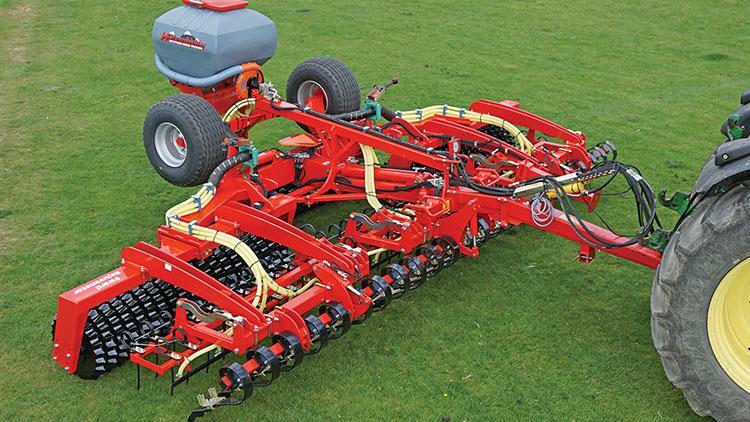 Options on the range include a following spring tine harrow, and the firm’s air-seeder unit to allow overseeding via six outlets across the machine’s working width. Price ranges from £9,453-£12,523 for three-five leg models respectively. Specifying hydraulic auto-reset adds about £1,100 to the retail price. 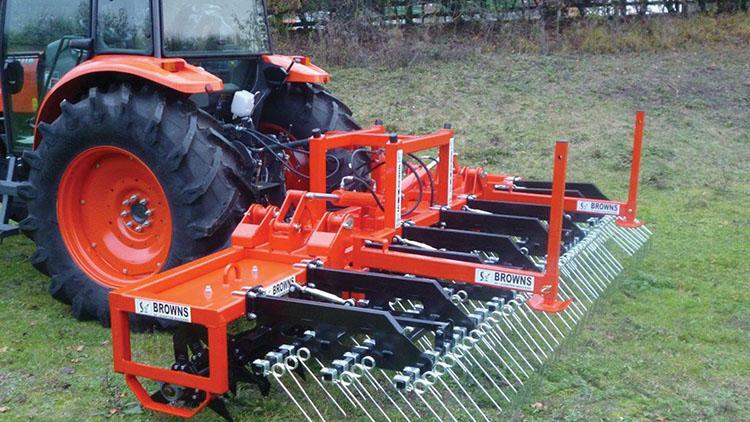 Aiming to alleviate surface compaction in grassland, UK manufacturer Browns offers a range of aerators. Capable of working down to 205mm, the firm’s aerators are fitted with about 16 spiking blades per metre. Blades are equally spaced along the machine’s width, and mounted around the shaft in sets of three. To evenly distribute pressure, blades are staggered in a helix arrangement. Working widths include 1.6-metre, 2.3m and 3m wide rigid models, and 4.5m and 6m wide hydraulic folding models are also available. Options on the machines include three rows of spring tines, rear consolidating roller, TurboJet over seeder and additional bolt-on weights for greater penetration. Retail price for a 4.5m wide aerator is £5,235, optional extras, such as 115kg worth of additional weights cost £340, spring tines add £3,000 to the price, and a seeding unit costs £5,150. Worcestershire-based manufacturer Weaving offers a Simple approach to rejuvenating your vital grassland. 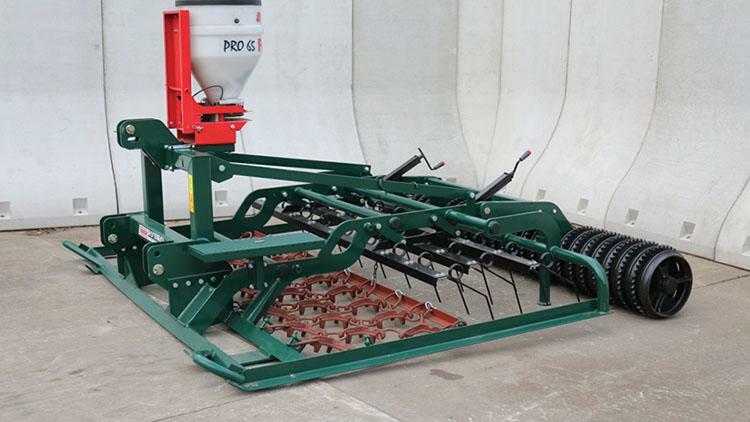 The PR Pro features two fixed levelling bars, followed by a section of chain harrows to level the soil surface. Three rows of height-adjustable spring tines follow to rake and clean the existing sward, while improving air and water infiltration to help stimulate growth. A Stocks Fan Jet broadcasts seed across the machine’s width, before the Cambridge roll, which aims to retain moisture to boost seed establishment, consolidates the ground. The broadcaster uses a deflector plate to prevent seed being applied over too-large of an area. Retail price for the three-metre wide machine is £5,800 plus VAT. Developed from its collaboration with New Zealand drill manufacturer Aitchison, SimTech manufactures a range of low-distrubance cultivator drills. Two models make up the range, measuring 2.4 metres and 3m wide; both models use gravity to distribute seed. The drills feature a sponge metering wheel, which the firm says can cope with seed rates from two-400kg/hectare, and can cope with a wide range of seed types. 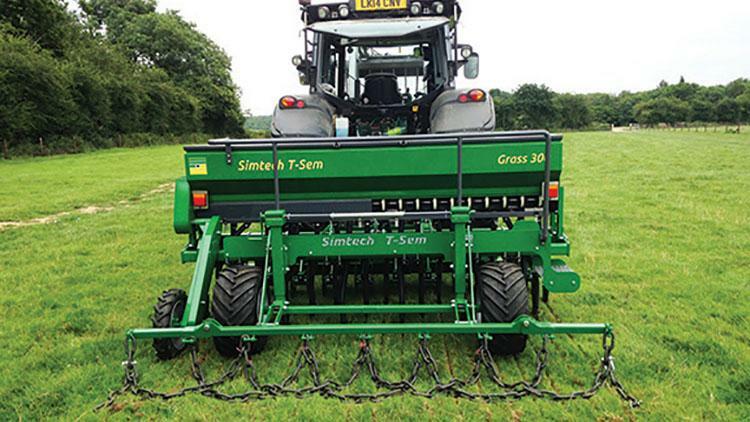 SimTech also says the drill can work in grassland, stubble, cultivated ground and cover crops. All models feature a single row of leading discs to slice the sward, which are followed by three rows of low-disturbance t-shaped coulters. Rear chains follow to level the ground. SimTech says the action of the coulter, over a conventional disc overseeder, produces a greater environment to encourage seed establishment. Retail price for the 3m wide box drill is £16,500.